DENVER (AP) — Adrian Gonzalez hit an RBI double in the 14th inning, sending the San Diego Padres to a 5-4 victory over the Colorado Rockies on Saturday night in the first extra-inning game for both teams this season. David Eckstein, hitless in six previous at-bats, began the inning with bloop single off Manuel Corpas (0-1), the Rockies' seventh pitcher. Gonzalez followed with a double that rolled to the right-field wall, allowing Eckstein to come all the way around. Tim Stauffer (1-0) pitched three scoreless innings for the win in a game that lasted 4 hours, 27 minutes. Heath Bell allowed a two-out double in the 14th to Brad Hawpe, who hit two home runs earlier. Bell then intentionally walked Ian Stewart before striking out Chris Iannetta for his second save. Iannetta homered in the third. The Padres, who stranded 13 runners, loaded the bases with two outs in the eighth when Gonzalez singled, Kyle Banks doubled and Chase Headley reached after striking out on a wild pitch. But reliever Rafael Betancourt got out of it by fanning Will Venable, who had a bases-loaded triple in the fourth. In the 10th inning, the Padres got runners to second and third with two outs but Venable was retired by Randy Flores on a comebacker. Venable came up with the bases loaded and two outs again in the 12th but lined out to left field against Matt Belisle. Hawpe's first homer of the season in the fourth pulled the Rockies within a run. With two outs in the sixth, he hit another solo shot off Mat Latos, tying it at 4 with his second career multihomer game. Colorado starter Jason Hammel had a 2-0 lead until a 38-pitch fourth inning when the Padres scored four runs. Gonzalez had a one-out single, Banks was hit by a pitch and Headley walked ahead of Venable's triple. Venable scored on Everth Cabrera's two-out double. Latos allowed four runs and seven hits in six innings. Hammel gave up four runs and six hits in seven innings. Iannetta opened the third with a homer off Latos that sailed over the right-center wall into the Rockies' bullpen. Carlos Gonzalez singled to score Clint Barmes, who had doubled. NOTES: The Rockies reassigned LHP Joe Beimel from extended spring training to their Triple-A club in Colorado Springs to get back into pitching shape. The reliever was signed to a minor league contract on March 23. ... Though he was thrown out trying to stretch the first of three singles to a double in the second, Headley remains the only Padres player with a hit in each of the team's first five games. 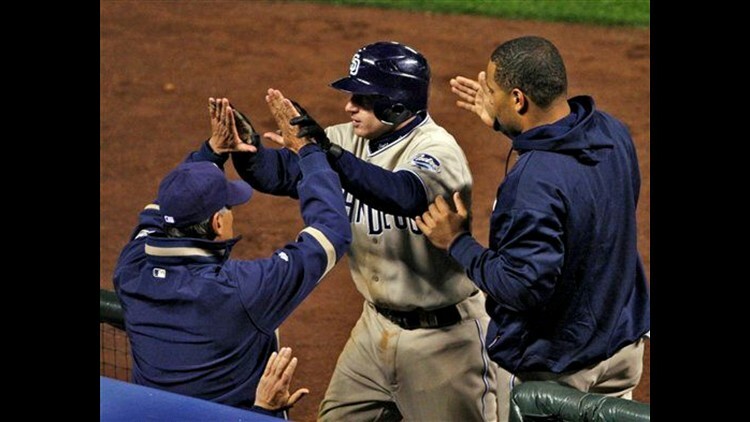 ... Hawpe's only other multihomer game came May 16, 2007, when he connected twice off Arizona's Brandon Webb at Coors Field. ... Hammel has a no-decision in each of his five career starts against San Diego.